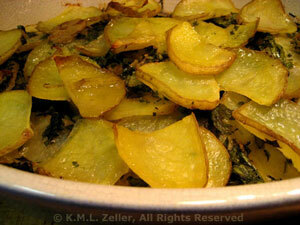 Potato Gratin, Fresh Herbs and Garlic, Thyme for Cooking gourmet menus. This is something I watched "The Two Fat Ladies" do on their cooking show. Perfect for late summer, flavored with lots of fresh herbs and garlic; I hope I can do them as well as Jennifer. You can modify the herbs to suit your taste, just use lots! Put slices in a large bowl of cool water and set aside. Finely chop garlic and mix together with chopped herbs. Remove potatoes from water, lay out on kitchen (paper) towels and pat dry. Drizzle a bit of the oil in a glass baking dish, just large enough to hold ingredients. Make a layer of potatoes, sprinkle with a bit of the herb/garlic mixture and drizzle with a little oil. Pour the stock over all, cover with foil and bake at 400F (200C) for 30 minutes. Remove foil and continue baking another 30 minutes. Top potatoes should start to brown and get crisp. Note: I use a scissors to snip the herbs first and use the flat of a large knife to smash the garlic. Then combine the herbs and garlic and chop finely, using a large knife in a 'rocking' motion.